Superfruit Slim is manufactured by Optimum Nutra, and have distribution centers in the UK and USA for worldwide shipping. They have combined the best superfruit ingredients, which are extremely popular within the diet pill industry. By using the right ingredients in the right amounts to promote weight loss, they have become a well-known brand. It seems that all in all this product has ingredients that really do work, and could help you reach your goals. 408 comments Page updated Feb 20, 2019. First published Dec 12, 2012. Claiming to have helped over 43,800 men and women lose weight, Superfruit Slim has a new and improved formula to help you achieve your goals with the power of Green Tea, Acai Berry, African Mango and CoEnzyme Q10. It makes a lot of claims, but can it live up to them? We will assess all the facts and see if this is just another marketing gimmick or if it’s the real deal. As soon as you go to the Superfruit Slim website you are greeted with bright colours and bold text that draws you in with the question, “Struggling to lose those stubborn excess pounds?” If you are, then they offer to help you do just that. Straight away you are told that there is a 60-day money back guarantee and discreet shipping, so you know your details are safe. Sometimes companies enroll you into auto-shipment with people being unaware this has happened. The good news with this product is that there is no auto-ship option so you can be happy knowing that you are only paying for what you want. The manufacturer is Optimum Nutra, established in 2011, and they produce a few supplements and have distribution centers in the UK and USA for worldwide shipping. They work within Good Manufacturing Practices, which shows quality, safety and efficacy are important to them. On the website it states that you take two capsules daily with water just before eating breakfast, no later than 10am. Each bottle contains 60 capsules, which is enough for one month. What does Superfruit Slim claim to do? All the ingredients are 100% natural so they don’t take a toll on your body like other dietary supplements out there. Good news for vegetarians and vegans as well as it is suitable for them, making this a supplement fitting for everyone. One good thing about this supplement is that they don’t make outrageous claims about weight loss. They say that it all depends on how much excess fat you have to start with, as the more you have, the more you will lose. Superfruit Slim contains 7 active ingredients in one capsule, 4 of which are classed as superfruits, meaning they have potent antioxidants and nutrients. They don’t use small quantities of the ingredients and no fillers are used, which is common in most diet pills. As well as the active ingredients listed below, it also has the inactive clear vegetarian capsule and Magnesium Stearate. A popular ingredient that is said to promote weight loss and contains potent antioxidants which are beneficial for cardiovascular and digestive health. There is 2-4 times more acai berry in the supplement, more than what most brands have. Also known as Irvingia Gabonensis, it has been known to promote an average weight loss of 28lbs after 10 weeks and an average decrease of 3.2% of body fat, when 300mg is taken each day. The Superfruit Slim capsules have more than the amounts seen in the study. This ingredient is shown to have stronger antioxidant protection than vitamin C and E. It contains the perfect amount to promote weight loss by increasing fat burning with thermogenic and anti-oxidant properties. Often found in diet pills, it has been proven to boost alertness and energy levels. In 2 Superfruit Slim capsules there is the equivalent to one cup of coffee, which makes it unlikely to cause any jittery side effects. Studies have shown that it increases alertness and promotes a raised metabolism. A plant that is used for improving thinking, concentration and memory, as well as athletic endurance. Used to enhance physical and mental performance, as well as increasing energy and resistance to the effects of stress. Online Superfruit Slim stress that the dose in their capsules is what you normally find in products just containing this ingredient. When this ingredient is used alongside other nutrients they can be absorbed up to 150% quicker. This is because black pepper extract can increase the bioavailability of nutrients in foods and supplements. There has been a lot of talk about 4:1 extracts with this supplement, but what exactly does this mean? Put simply, it’s a way of getting a more concentrated version of the active ingredients. So instead of having, for example, 400mg of the active ingredients as seen in other supplements, a 4:1 extract gives you 4 times the strength! Superfruit Slim has combined the best superfruit ingredients, which are extremely popular within the diet pill industry. By using the right ingredients in the right amounts to promote weight loss, they have become a well-known brand. It doesn’t contain stimulants and only includes a small amount of caffeine that won’t have bad side effects like some supplements that contain the ingredient. On the site, it claims that there are no negative side effects to using this product as they use 100% natural ingredients. But most diet pills that contain fruit extracts have less side effects in general. Even though there is some caffeine in the supplement it is very unlikely that you will suffer any of the usual side effects associated with the ingredient. Do not exceed 2 capsules per day. Always swallow with water. Do not take if pregnant or nursing. If you have any medical conditions or are taking any medication, consult your doctor before use. Not for people who have a body mass index (BMI) of less than 18.5 or are under 18 years of age. This product is not intended to diagnose, treat, cure or prevent any disease. On the official site, there are a few testimonials but we are unable to confirm how genuine these are, as it is only sold in one place. There have been lots of clinical tests regarding these superfruits to prove that they do offer benefits that will help with weight loss. We take a further look into the main superfruits in this supplement. The acai berry is native to Central and South America and is a relative of the blueberry, cranberry and other dark purple fruits. It is the subject of health claims but hasn’t been verified by the European food regulator EFSA. Acai berry contains one of the highest levels of antioxidants as measured by the ORAC values (Oxygen Radical Absorbance Capacity), which is the measure of antioxidant values of foods. The berries are rich in healthy omega 3, omega 6 and omega 9 oils, with a great source of fibre to make them effective at fighting damage “free radical” toxins in the body. It seems that all in all this product has ingredients that really do work, and could help you reach your goals. It’s always refreshing to see a product that offers a money-back guarantee as a lot don’t. Superfruit Slimoffersr a no-nonsense 60-day money-back guarantee on every order from the purchase date. Returns are accepted when only one bottle in your order has been opened. Superfruit Slim is only available from the official website. We’ve been informed that there are time-limited savings available. We would advise readers wanting to purchase Superfruit Slim to check the website for real-time pricing. A five bottle package now costs £117/137€/$149. FREE DELIVERY on all orders, anywhere in the world. You have the option to pay with credit card or paypal. It isn’t often we see a product that seems to be everything it says it is, especially one that claims it is the “strongest” on the market. At the beginning we were wary, but the more we researched this product we became pleasantly surprised that it does live up to the claims. By not containing any serious stimulants or fillers it is an all natural supplement that has a healthy approach to weight loss and uses superfruit ingredients that are seen in other supplements, just all in one. We love that it is cost-effective, with different options for what you’re looking for. What’s even better is that it offers an amazing money-back guarantee offer that not a lot of products have nowadays. At least if you do give this product a try you have the assurance that it is relatively risk-free. With the chance that there a no side effects we can’t think of a reason why you shouldn’t give this product a try, with some ingredients that have had clinical studies take place. If you want to take a diet pill that is full of superfruits to help weight loss and provide a great source of antioxidants, then this is a good choice for you. Overall, we highly recommend Superfruit Slim. Does Superfruit Slim really work? Yes, when combined with healthy diet and exercise. This isn’t a magic diet pill and like any effective diet pills requires work from the consumer too. The list ingredients work to boost metabolism along with suppressing appetite to help increase calorie burning and reduce calorie intake. How do I take Superfruit Slim tablets? The suggested use has confused a few consumers due to the wording on the label. We have highlighted this to the manufacturer who is aware of it. You only need to take 2 capsules with 8 ounces of water before breakfast or take the 2 capsules before your lunchtime meal. If you forget in the morning you can take in the afternoon as long as its before 5pm, this is because a small amount of caffeine is present (see below). As with all supplements, do not exceed the recommended dose of two capsules per day. How quickly will Superfruit Slim work for me? Some consumers have reported losing several pounds within the first week, some 10-11 lbs in 2-3 weeks. Results will vary as metabolism and amount of weight to lose varies significantly from person to person. We like the fact that Superfruit slim doesn’t make exaggerated weight loss claims to entice new customers. Do I have to change my diet when taking Superfruit Slim? We always recommend looking at your diet when looking to lose weight as calorie intake plays a central role in weight management. Superfruit Slim takes the same approach and encourages a healthy diet combined with exercise for the best results. You may well experience weight loss without any changes but the long-term weight loss and management (not to mention health) dietary changes are recommended. Are the ingredients in Superfruit Slim safe? All the ingredients are 100% natural and 100% safe so you’re unlikely to suffer from any side effects. How much caffeine is in Superfruit Slim? Compared to many supplements on the market Superfruit Slim contains very little caffeine. This makes this supplement a good choice if you’re sensitive to stimulants. This is around 1 cup of generic brewed coffee. How long can I take Superfruit Slim for? All the ingredients are safe to take for as long as required. We would suggest only taking for a maximum of 6 months though and then having a complete break – we would say this for ANY supplement you decide to try. Can I buy Superfruit Slim from Amazon or ebay? If you see any Superfruit Slim on sale in Amazon or Ebay then they are unlikely to be the real 100% original supplement. So it’s advised to buy directly from the official website. 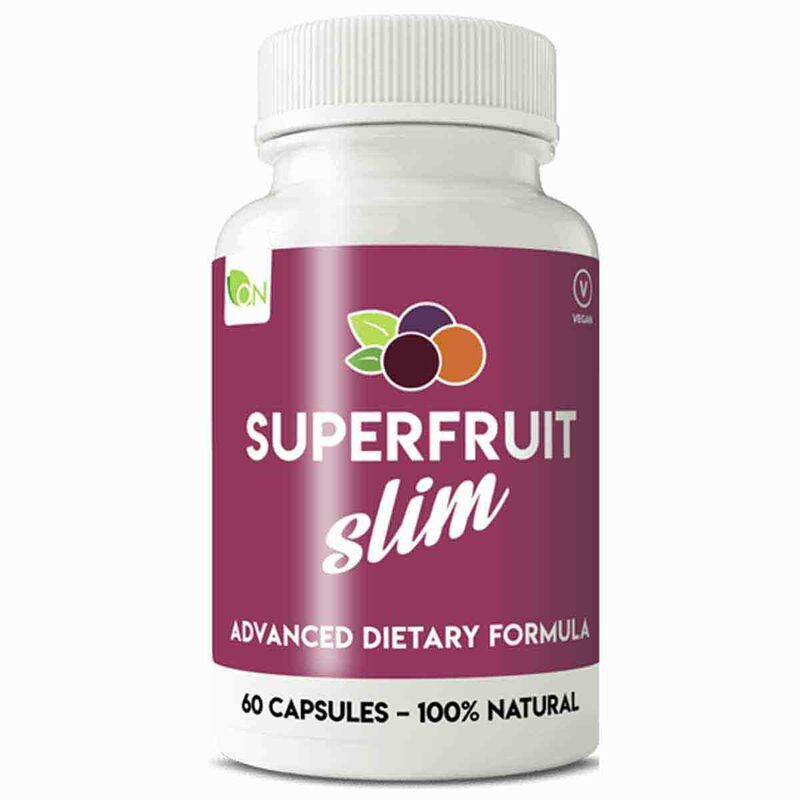 Can I buy Superfruit Slim from South Africa? Not at this time. Reports from the manufacturer of issues with the South African postal service means you can’t buy Superfruit Slim from South Africa. Whilst disappointing, the manufacturer has assured us they are looking at alternatives. Where can I buy Superfruit Slim? You can buy Superfruit Slim from the official website (https://www.superfruitslim.com). It may be available through eBay, but we’d urge caution buying from a third party since only buying directly from the manufacturer gives you the 60 days money back guarantee. Price for one bottle is $59 (£39). A two bottle plus one free package (three bottles in total) costs $99 (£77), and a three bottles plus two two free (five bottles total), enough for five months, costs $149 (£117). How about any Superfruit Slim discount codes? There are deals to be had on buying more than one bottle (as highlighted above) but no promotion codes are currently available. We have requested some for our readers, so watch this space. would I be able to lose belly fat by taking diet pills of any sort. I am 67 years old and was diagnosed age 11. Hi I was just wandering is it safe to take these pills if i’m taking propranilol (beta Blockers) & rivaoxiban (Blood Thinners)? I did ask my GP but she wasn’t prepaired to answer one way or another! I have completed the 1 month YOLI plan and did lose 10lbs however cannot afford $200 to $300 each month to continue so am researching and trying to find an alternate more cost effective option. Has anyone else tried this product to replace YOLI and how has it worked in comparison? I would really appreciate any input! Thanks! Great feedback Jeanine and well done. Interested to know why you think the product costs $200-$300 per month when looking at the prices in our review is showing $60? Would this be an effective fat-burning supplement for someone trying to reach a very low level of body fat in order to enter physique/bodybuilding competitions? I was a loyal saba protrim user until I couldn’t afford it any more. Does this stuff have the same ingredients? I had gallbladder removed and it was the only stuff that kept me regular. I’ve been searching for the same effect in another brand. Please help I’m in my 40s and depression has taken up a life inside me. I’m currently 40 pounds over weight and registering as obese. Hi just wondering if Advanced Superfruit is okay to take with Vitamin D tabs? (Vitamin D3 1000IU/day). I have just started my first dose of Superfruit today – so far so good!! not feeling at all hungry. Thanks guys for the recommendation. Just finished third bottle and feeling great. Lost 29lbs in total and just 8 more to go and I am set. Awesome supp! I was having several coffees on top as well, no issues. Although I have weak heart. So, not quite sure about the ingredients in the summer fruit slim bottle. I had to give it a go, because of people’s good reviews. Ah well, there’s first time for everything I suppose. Good luck on loosing remaining! This sounds great, except the ginsing makes me nervous. Isn’t it bad for your brain? Was looking into a dietary supplement and had stumbled upon Bio X4 which lead me to your site. I am a type II diabetic currently controlled with medication and I have high cholesterol, also medically controlled. Are there any medication contraindications for diabetics? My true goal is to get off my medications and stop the “gut” ache I always seem to have from them so that I can be more active. Thank you. After beginning this product, i started to eat more at first for one to two weeks and had sudden cravings for sweets. I then noticed my appetite decreased and I was full on one meal a day. However, I cannot say that I lost weight, I actually gained 5kg in two weeks and going back to phentaslim to loose fast pounds and this time I will keep it off. Phentaslim helped me loose 5kg in one week and the same the second week after stopping it, so I lost 10 kg in 2 weeks on phentaslim and took it for only 2 weeks so saw the results after 4 weeks and yesca total of 10kg! I got stressed and been overeating with not much exercise so determined to get it off finally! What happens if you take the pill during the day but not with meals specifically? Maybe after breakfast or lunch or something at some point? These guidelines are normally given as they will get you the best results from the supplement. While nothing might happen if you take them at different times, it is always best to follow instructions so nothing goes wrong. Over 40 now and everything is harder. Have been working out and eating better but need that little boost. Just ordered, hopefully will help. Will post results in a month. Fingers are crossed. I’ve been dieting on my own for a year and a half. I’ve gone from 280 pounds to 195 pounds with calorie counting and very light exercise. I’ve plateaued and hope this will help kick me back into gear. I’d like to lose 20 more pounds so I ordered the 2 months supply. I’m impressed with the study and the reviews. I hope this works. Got a call from fraud alert later in the day about the rejections, wanting to confirm it was me and that someone didn’t try to steal my card. Contacted the company, and they said none of the orders went through, i wasn’t charged, and it’s because they use an overseas bank and my bank won’t allow the transaction. I either have to have my bank approve the transaction or i have to put $$ in paypal and do it that way. There is NOTHING on the site that warns of this. Has anyone else had problems like this? Such a hassle….. Desperately looking for a supplement to aid my weight loss. Recent diagnosis of knee arthritis has limited my exercise and I’m wondering if Superfruit will help and will it bother those on blood pressure meds? Want to try but got scam by easy 100 never received pills or money back.Would like to try these pills for health benefit as well as weight loss. It says this pill is not for people who have BMI under 18.5. My BMI is 19.9, and I have 32.8% of body fat. Will this product work great for me? Or should I buy another product for better result? Jackie, the point is, you should not be trying to lose weight. A healthy BMI is 19-24.5. It’s quite concerning that you feel you want to lose more, but I guess that’s up to you. The more muscle you have, the more fat you will burn. The most important thing for you is a balanced diet to maintain your general health, not cutting out more calories. After reading so many positive reviews I went ahead and purchased a 2 month supply of Super fruit Slim. I’m 5’10 212 pounds, pretty muscular but not very cut anymore now that I’m 26. I’ve been going to the gym about twice a week and play basketball once a week, due to my busy work and school schedule. I will also be jogging every other day to burn 500 calories each time. I want to lose 20 pounds in the next 3-4 months. I have bought healthy food to properly diet with primarily high protein (meats, eggs, & beans) and low to no carbs for about 1500 calories a day. I’m hoping Combining all those factors together I will be able to get to 190 lbs by June 2016. I’ll try to post my results in a few months! Hi Harrison, I am wondering how you got on with the pills? A lot of people do not come back to report their results so it is hard to know if these pills would be worth buying or not. is the website one of those site where they will continue to charge you monthly if you do not cancel before 30 days? No, the company don’t do auto-bills so one off purchases are the only type you can make. That way you are guaranteed to only get what you want and need. Ok, it’s been nearly a month and I’ve lost a stone so far. I don’t know how much of this is due to 5:2 and how much to Superfruit Slim though. I felt more hungry and a little jittery on the first day but I think that was the caffeine as I don’t usually have much at all. Since then I have had a few “hungry days” but mostly coped fine on the fast days. I spoke to a local pharmacist and she said I should not take Superfruit Slim long-term as one of the ingredients can be bad for the heart. So, so far I’m not completely sold but I’m very happy with my weight loss so far and these capsules are obviously playing a part! I’m 66 years old & taking Irbesartan & Zircol for my blood pressure, also I take Avanza 1/2 tab once a week for my anxiety, I also take some supplements like garlic, vit B, vit. D, calcium, ginkgo, would it be safe to take Advanced Superfood Dietary Formula? Yes, I’m also overweight. I just received my order this past Monday. I’m hoping to lose 7-10lbs. I’m 45 and an avid athlete that runs and plays soccer still at my age 4 times a week. This year I noticed weight just crept up on me and I haven’t been able to lose it. So far a little jittery just because I never ever take caffeine I think??? Hoping the jitters will go away. I bought these after reading the watchdog review and was very keen to start taking them to lose weight for my holiday in March. Im eating very healthily and exercising regular yet I am permanentley hungry in fact my stomach grumbles so much I sometimes feel sick. I was less hungry before I started taking the pills they certainly have not suppressed my appetite ???? Not everybody is the same when it comes to dieting supplements. What kind of diet do you have when you exercise? We always suggest using these kind of pills with a healthy diet, especially if you are exercising a lot. We would suggest consulting with your doctor to be sure, but the general consensus is that if you are on any medication it isn’t a good idea to take any form of dietary supplement with it. I’ve just started taking these yesterday after reading this review. I want to lose 5st for my wedding in August (a loss of 2lb a month) to get me to a healthy BMI and feel confident for my wedding photos ???? I’m combining with the 5:2 diet (still calorie controlling on the other days as if I don’t I tend to overeat), and I’m hoping that these pills will help me maintain weight loss. First impressions are that customer service is very good (fast delivery and quick response to an email even though it was the evening). I think I could feel the effect of the caffeine yesterday (I normally have virtually no caffeine in my diet) which made me feel a bit nauseous and hungry, but I’m hoping my body will get used to that soon. If not I’ll be taking advantage of the 60 day money back guarantee. I’ve found these comments really helpful and wanted to give something back, so I’ll post more about my experience for other potential buyers as I go. ??? was meant to be a 🙂 – site didn’t recognise the emoji. Yes this is still one of the best diet pills that we recommend, along with Phentaslim. We have recently approved some more diet pills called Skinny Medical and Garcinia Cambogia Extra. Ok, im tempted to buy some but i want to know from people who have already taken it if after years they didnt gain all the weight back, will the effects last? Or will i gain it all back as soon as i stop taking it? I’ve read thru Most of all the comments.. Not too many comments/testimonials this past year (2015).. Has the product changed any since the first comments/Testimonials!?? I have been using Saba ACE… which has changed ingredients So Many Times in the about 3-4 years I’ve been taking.. Their latest product I CANNOT take.. There’s a herb in there.. That did not agree with me.. So I’m looking for help with another product.. I liked the reviews.. And your approval and in depth review, Watchdog, has been insightful!! Is this Still Your #1 that ‘you approve’!!?? Thank you! WHat happens after the free trial period? What is the regular monthly charge? We have checked again and there is no trial offer on this supplement, you only pay for the package you select. As such there is no monthly charge. What made you think otherwise? Hi, I was just wondering if it is okay to take superfruit slim while I’m on protein shakes and creatine monohydrate? Glenn, what is your final review of this diet pill?? How long did you stay on it, did you get any results? Amend comment; Due to baby brain I have given wrong information with regards the time I take the capsules, oppppssss sorry. I take the capsules with food and not an hour before as I previously stated, However, the latest I have taken the capsules is half an hour before food and I have still felt the appetite suppresant. I am 4 years past a full RNY gastric bypass and starting to gain weight again. Could I take these pills please? Just ordered, I’m now in my fifties so done with athletics as I got a new hip a year ago, time to drop 30 pounds and extend my active life. I’ll update a month into the program???? Pills arrived yesterday, 3 months supply, I’m hoping for the best. Fewer calories is the key so I hope the pills help me reduce portions. I can’t really exercise.. Is it still worth me trying the diet pills? Just ordered this. I am 174cm, 139lbs (approx 63kg). I walk 1h per day on average, follow intense workouts twice a week and one other low intensity workout during the week. I eat 1400cal per day on average. I eat very healthy meals but tend to snack on empty calories. I’m currently taking a veggie powder in the morning and ore workout prior to workouts. If I were to use this product would it be beneficial to scrap the ore workout and greens powder or take all three in tandem? Bought the super fruit slim a few days ago, so will try it along with moderate diet and exercise. The only thing I am concerned about is that it was not approved by the foods standards agency, what assurances do I have of this not containing the ingredients highlighted within the container? can i order these in India? and am i required to take them even once I’ve reached the required result? I bought this supplement and guess what ,………..IT REALLY DOES WORK!!!!!! I’ve tried every diet under the sun and pills, drops etc and can honestly say, hand on heart, that this one does really help with weight loss when combined with healthy eating! I also sleep like a log now, have loads more energy during the day, shiny hair and my skin has improved too. I fully recommend Superfruitslim! Hello. Ive been reading alot of these comments and are hoping this product works for me. Im currently laid off at hom so I have a ton of time to exercise but no motivation. Id like to lose at least 50 pounds. Does anyone think its possible with this product? Thank you Watchdog for such an informative report.I will be ordering from Ireland and i was wondering will i be charged extra in customs..and is it legally safe to be sent into Ireland?? If these were vegetarian capsules I would have bought. Are they ever going to be? Their web site states: *Now with veggie capsules – Suitable for vegetarians. I ordered few weeks ago and felt I should give feedback on my progress so far. Llike many I was super excited to try superfruitslim as I have tried numerous other things from simple dieting to other supplements. Always worried about taking supplements that cause side effects and thats what got me interested in this one. So my results so far, I have lost just under 10 lbs in 10 days from eating healthy and taking 2 capsules per day. I am happy so far and will continue to take the 2nd bottle. Hope this helps. I won’t allow my circumstances stand in my way. I have to get this weight off so I can live again. I’ve been hiding way toooo long. My daughter needs her mom to leave the house and stop being ashamed of her weight. Hi Dana, can you please give an update on your progress in taking these pills? I’m very interested in getting some for myself. I just ordered this product and I am totally excited, I’m crossing my fingers I hope it really works. I’ve tried other products in the past and nothing seems to help. I want to lose about 30 lbs, I’ll definitely keep everyone posted. Hi everyone, i’m thinking of ordering this product but my concern is what happens after, when you stop taking the pills. Could someone assist me please? Thank you in advance. I think the key is to give your body breaks. I have nothing but good things to say about the product. I guess the only negative is that i think my body got used to the mango extract that suppresses apetite. Drinking lots of water and green tea will help. I’m considering going back on this and replacing breakfast and lunch with shakes to “shake off” this final stone i want to lose. As an Insulin dependant diabetic (2x lavamir + 3x novorapid) as well as metformin (1grm 3x a day) is this really suitable for me? We would recommend anyone taking prescription medication to seek medical advice prior to taking any dietary supplements. Your physician will know your complete medical history and whether taking such supplements are likely to interact with your medication. Hi Sandra, how are you doing? Did you loose any weight? Do these actually work, If I order them am I signing up for a hidden subscription? Just want to take them to give myself a boost losing weight. I do not intend to take them for ever or anything. After been scammed by the Raspberry ketone + prima cleanse I am very wary, though I eventually got my money back. Advice please? Hi, did you actually buy the product ? Has it been effective ? Any latest review? Please, I have to make a choice > Phentaslim @ Superfruit? Help me! I want to say goodbye forever to all my ugly fatssss! Hi ,I have just ordered these pills today after reading lots of reviews on the watchdog site ,like many people I’ve tried different pills,diets and exercises and realise I need to be in the right frame of mind for any real results ,just think these may give me the right kick start and support if I start to go off track, I’m 5ft4inchs and weigh 11st3lbs at 33 years old .I plan to eat a balanced diet and gentle exercise (to begin with) and weigh myself once a week same time and place. I will post results ,fingers crossed good luck to others trying this product and thanks to watch dog for all the clear information and reviews on this product.???? I’ve just ordered these today! Fingers crossed they will work for me I need to lose around 20lbs as I’m 5ft 4in and weigh 10st 10lbs! My problem is the binge eating at night! I can be good all day, but when my husband and kids go to bed! I relax and stuff my face with anything and everything! Because I love food!! It’s a comfort that I can’t control. So hopefully these tablets will stop the binge eating at night for me! And with that alone I could probably loose a stone in a month!!! But we will see. Has anyone had any other success stories as this seems to be the only site with real people reviews on these pills? Where can i buy this? I live in asia. Just ordered my first bottle, will update regularly and be brutally honest! Currently 13 stone 11 pounds and want to be 10 stone. As far as I can see from the comments posted so far, most of the people who are happy with the product mostly talk about its hunger suppressing qualities. I am not much of an eater, I don’t have a huge appetite and I generally eat very healthy. Having said that, I need to lose 7-8 kilos (about 15 pounds, I think) which I am struggling to do, even with regular (albeit moderate) excersise because I have a terrible metabolism (both genetics and a thyroid condition contribute to that). Could I benefit from the Superfruit Slims? Do they increase metabolism (I didn’t read anything about that in the description)? Should I try something else? It’s super important to me that the product is 100% natural, as I prefer moderate result on a safe pill, rather than ingesting any chemicals. Thanks! I only have about 7lbs to lose, but boy its so hard! so after reading the reviews I think I will give it ago as its natural. I would be interested to know if the last buyer Jules lost weight. Jules you had 15lbs to lose and since Jan 3rd have you had any positive results? Hi people. I’ve been taking Superfruit slims for a month now and I’ll get straight to the point-they’re working for me. I’m 5″6 and weighed 12 stone 12 and a half. I’m not a big guy by any means I just have a bit of weight around my torso that I want to lose. I think 11.5 would be a good weight for me. Even when I was slim I was heavy, just one of those heavy people I guess! Anyway I’ve been eating healthily with a couple of treat days a week whilst I walk 15 minutes to work everyday and have a half hour run after work 3/4 days a week and run one day on the weekend. So that sets the tone. In the first week I dropped 3 pounds, second week 2 and the third week 0, and I’m yet to weight the fourth week. It’s definitely helped because I’ve done this sort of exercise before, with healthy eating and not lost weight so fast. The third week was 0 because I lost my grandad and didn’t exercise as much and didn’t eat great, usually I think that week would’ve resulted in putting weight on. The appetite suppressor is great, I work in an office and have a soup/sandwich for lunch. Before taking these I’d have a snack with my lunch as well as mid morning and afternoon snacks. The snacks rarely happen now. I have more energy than I did before and the only thing stopping me running further is my legs going! So to summarise – I’ve gone from 12/12.5 to 12/7.5 in 3 weeks. Oh and for those who work in KGs not stones and pounds, I’ve lost 1.6 which I think makes it sound more impressive as that is the same as one of those very large bags of sugar! Hi Lewis, how are you doing? Did you loose any extra weight? I ordered the pills and waiting for them to arrive and i am very anxious, since i am always on diet and never managed to loose weight 🙁 I really hope this will help me. I started taking superfruit slim 10 days ago. For the first 5 days I was super excited and very careful about what I ate. I walked daily for 30 mins. I lost 3 lbs. Got a bit slack for the past five days, while not overeating, I have been eating more sugars and nuts, when I weighed myself today I regained every lb. Shame on me. I will get back to a healthy diet and exercise routine as I have more energy and an urge to eat less SOMETIMES. I will update in 10 days. Hi, I read most of the comment, quite interested with the product. But i would like to know what will happen when i stop taking it?? will i craving for food or is there any side effect after taking them? I just ordered these and I hope my story will be as successful as Jo’s! I’m comforted by the money back guarantee. I will update you with what I find as soon as I start to see results, or lack thereof. I’m currently still nursing my 13 month old. I haven’t been able to lose the baby weight yet and really need to lose at least 15 lbs. To be at a healthy weight for my body. I am having trouble finding a weight lost supplement that I cam take while breastfeeding. The ingredients in this seem so natural and harmless. Why isn’t it safe? Hi Natalia, i was breastfeeding my child too, and i know how it feels. I suggest you to be more patient and wait until the end of breastfeeding. Try to eat healthy and not to gain more weight, and then when breastfeeding comes to an end you can take some pills. I’m planning to order Superfruit Slim, but am currently taking Skin Accumax (supplement to clear out my skin, and has no diet related benefits) two tablets, twice a day. Can I still take Superfruit alongside with Accumax? I have been on Superfruit Slim for 3 weeks now. I started taking the tablets (2 before breakfast) at the same time as starting on a low fat, low calorie diet. In the first week I lost 8lbs (a lot of this would have been fluid lost, rather than fat). In the second week I lost 2lbs and in this third week I have only lost 1lb. I think that my weight loss is largely down to the low fat, low calorie diet, I have been very strict and have exercised a lot. However, I certainly agree that Superfruit Slim contains a strong appetite suppressant, it has curbed my appetite and I have even found myself having to put half of my meal in the bin as I am too full to finish it!! In my experience in dieting, nothing works better than a sensible diet combined with exercise but I have found that adding this particular appetite suppressant really has helped to stop cravings and eating between meals. This certainly isn’t a miracle pill but it does help reduce your appetite! I have another 13 weeks supply of pills and am looking to lose another 10lbs so I’m hoping that the weight loss will speed up a little as I’m not a very patient dieter!!!! For your interest, I am 5ft 3ins and weighed 10st 9lbs at the start of this diet, I wasn’t massively overweight but had a few lbs to lose! Hi I’m fourteen and over weight. However I have been exercising and dieting for almost a year now and have seen no real results and parents are now nagging me to lose weight and I am trying. I know most pills are aimed at over eighteens but are any suitable for under eighteens. This supplement and others on this website will not be suitable for you as they advise to be taken by over 18 year olds. We would urge that you speak to your regular doctor/physician for assistance as they would be best placed to guide you. Hi, Can this supplement be taken along side Green Coffee Extract Capsules ? And what is the daily dose. After reading all the post, I believe I’ll give superfruit Slim a try. I am in my late 50’s and need to take quite a few pounds off my knees. Looking for good results… will report back after I’ve taken this product for a few weeks. Researching for 4 hours of various diet pills I have decided that Superfruit Slim will be best for me, thanks to Watch Dog Team also. The ingredients should be a health benefit also. I will be 68 in October and don’t need any product that will make me clean closets at 12 am or make me want to slap someone! I think this product will give me the boost and will power to achieve what I need to. I have ordered one bottle and if satisfied will order more. Thank you for all comments, reply’s and honesty. Could you please tell me whether the ingredients in these pills might contribute to a jojo-effect once I finish my weightloss program and stop taking them? I am aware that maintaining a healthy lifestyle is key to long-term success and I am willing to keep my weight low but I am afraid that these pills might cause my metabolism to slow down later on. Is it recommended to continue taking those pills as a supplement because of their health benefits even when I am no longer trying to lose weight? We appreciate the concern and wouldn’t recommend taking any weight loss supplement indefinitely. Using a supplement such as this one should work to reduce appetite and boost metabolism whilst taking them. There shouldn’t be a rebound effect of reducing your metabolism lower than your normal levels. As you mention in your post, the key is to be active and to eat a healthy and varied diet. These supplements should be seen just as they are intended, a “supplement” to your existing lifestyle. Please let us know the results if you proceed with these or any other products. Does anyone know of any valid coupon codes for super fruit slim? Just about to order my second batch , any help would be greatly appreciated! Hi, I ordered this product and just started it today, so jury is out. But I have to say the company has the best customer service I ever encountered! I just moved, ordered it using PayPal. But PayPal had old address, so I contacted the company to change address when it ships. They contacted me back ASAP, said they would and did. But, post office still shipped to old address. I re contacted the co., they apologized, and re-sent out a new order ASAP. But that’s not the end. Post office then forwarded the product even though they said they were shipping back to sender. I again e-mailed customer support to update and either stop the new order OR advise on how to ship back. AGAIN, they ASAP responded and said sorry this all happened and KEEP THE PRODUCT AS A GOOD WILL SIGN OF SUPPORT TO ME! Never had I experienced a co. that offered that kind of customer care. And so fast on response back. Same person handled me from start to finish.. Just had to state that. Never blogged before, my first trime. I will use this co. again with total faith. Hi, I took this tbs for a month and I didn’t notice any change at all like appetite suppess. Changed to a low calorie diet steamed & fresh veggies and reduce my fruit intake to the minimum. Also, doing 1 hr of walking and I’ve lost 3kg in one month. I think perhaps tbs work for some and not for others, maybe different metabolism. At least I’ve try them myself and not just judging the product because of people’s comments. Hi, has there been any changes on these pills availability in South Africa. I think I’m going to give this one a try after reading all the comments. I’ve tried others and don’t seem to do well with ones that contain caffeine (I get fuzzy, jittery and very lightheaded). I truly hope this one will work! I’ll do an update once I’ve received my order and get started taking them. Best of luck everyone! Hi, I started using these diet pills around two and half weeks ago. Like them very much beacause I lost 2.5 kilograms in these weeks. To me they help to boost my energy level and compress my craving for food. So it’s now more easy for me to eat healthy food and around 1500 / 1700 calories a day. Just purchased obesitrol then found your site wish I would have found you sooner. I wish I would have tried this product. We’ll do you think you would want my consumer review on this other product? I once bought raspberry ketones and found out when I felt lousy after taking them and googled “side effects” that they have salicylates in them. I have an allergy to aspirin and ibuprofen, both of which contain salicylates. I have had to buy most of these fat burning ingredients separately in order to avoid the raspberry ketones. Note that I experience no side effects eating raspberries fruits all by themselves. Im am interested in buying these but I dont want to use them for the rest of my life – my concern is what will happen after I stop taking them – I obviously will want to maintain my weight, not put on? I am on a diet plan with Weighwatchers and plan to stay there, so my healthy eating will still be in place as well as my excercise. I am just wondering what you need to do after you stop taking the pills, or is it something I will need to be on for the rest of my life? Im desparate to loose my last few stone. Just placed my order after reading the entire site of comments. I am encouraged but skeptical as with anything new. I exercise several days a week and already eat a lower calorie diet with lots of veggies but not having any success dropping my last 25 pounds. This is my forth time to be losing this weight due to my four boys but just really struggling this time. My youngest is about to turn four so this is a battle I’ve been fighting for quite some time now. Will update after starting the product. Fingers crossed. We tend to recommend trying one supplement at a time to ensure there are not increased chances in experiencing side effects. As the supplements mentioned are unlikely to contain high stimulants then you should be okay. You may wish to consult your local physician though as they will be fully aware of your medical history. Ive bee on these for about 2 months now and weight loss has been steady over that time. In as much thatI wanted to lose weight this time around in a more controlled manner rather than the Yo-yo dieting I have done before. So I have changed my diet to cut out pretty much all the sugar. I felt pretty yuck for the first couple of days and really believe that Superfruit slim helped with the urges I had to go back on the sugar. After the first week things got much better and I had a new lease of life with a lot more energy than ever before. This helped me start doing some light exercise and despite starting off at just over 300 pounds I actually had the energy to do some light jogging/ speed walking which was never possible before. So far I have lost 13 pound over 8 weeks which is less than other extreme diets I have done before but I seriously feel that this time its for keeps. Im definitely a convert and have been confident enough to recommend them to two of my close friends who are seeing similar results so all in all Im a happy girl. I have been trying without success to place ab order since 10th June 2014, but to date this has not been possible, despite me leaving messages and emails. I’m not impressed. I have now finished taking Superfruit Slim; I didn’t post before because I wanted to wait until I had given the pills a chance to work. Unfortunately, I haven’t lost any weight, and so am quite disappointed. I can however confirm that Superfruit Slim does initially give you extra energy, but as far as weight loss goes, I haven’t lost anything. I was also very careful about what and how much I ate while taking the pills, and I exercised reasonably regularly, so am at a loss to explain why I didn’t see the same results as other people have here claimed to have had. I’m glad that I only bought one month’s supply as a trial, since I would have wasted my money if I’d ordered enough to last me 3 months. Mark Adams – How’s it going? I’m tempted to try these but am very skeptical. i’ve gone through more money than you could imagine to try and loose weight. Phentermine is the only thing that has ever worked for me, but my dr moved and my new dr won’t prescribe it to me. i need to drop minimum 50 lbs, 60 lbs would be preferred. I’m so sick of spending money on things that don’t work and do nothing but depress me even more. I’ve had three kids and I’m bigger now than I was when I was pregnant with any of them. Someone please help me. Hi, I’m interested in taking Superfruit Slim but was wondering if you are able to take it while on Fluoxetine? I have been on Superfruit Slim for 2.5 months now, one poll in the morning and one in the afternoon. Sadly, the only difference I can feel is that I have stopped snacking – but I can’t work out if this is because of the pills or because I’m trying to be healthier. I haven’t lost any weight in this time, which will disappoint people here. I didn’t have any side-effects though, so I guess that’s a plus! Does anyone knowd if this pills are Gluten Free? I ordered the superfruit slim pills and got them last week friday. Been taking them for a week now and I gain 0, 4 kg.. I’m going to try to eat more healthy. Has someone got a good website for a diet? I got to this site after looking for information about KLB6 Ultra and I wanted to ask, if I need to lose 15KG (about 33 lbs), will a 1 month supply of these pills will be sufficient for a start? Our immediate response is that losing 15kg in one month is a fair amount to lose and will require more than just a supplement (even the ones on our approved list) but dedication and following a strict calorie controlled diet. To lose weight safely and in order to keep the weight off then sure and steady is the way to go. Although the advice varies slightly from country to country, its generally accepted that 2lbs per week is the accepted guideline. That said it is possible to lose more weight by following a calorie controlled healthy diet, regular exercise and taking an approved supplement can help. Remember dietary supplements are not magic bullets and complement a healthy diet and exercise. That’s why I said “for a start” because I wanted to know if they’re good for a start of weight loss. Hi, can I take Phenaslim with super fruit?…I meant phentaslim. We would recommend only taking one supplement at a time. Not only does taking two supplements run the risk of possible side effects because you could be doubling up the ingredient amounts but also the cost. Hi all I am just going to buy my first diet pill and once I get them and try them out I will post back. Even though I’ve been intending to try out Superfruit slim for months and months now, I only got around to ordering the pills last week! I’m really hoping they’re going to help me where other diet supplements have failed. Will report back once the pills have arrived and I’ve been taking them for a few days. Hi Mel & Jo – how are you doing now? Which superfruit helps to reduce cravings? Which superfruit helps to increase energy? Can anyone tell me if these pills will be OK to take after a gastric bypass done 3 years ago? Have lost 8.5 stone but can’t shift any more and am keen to give anything a go as need at least another 2-3 stones off. GP is useless as knows nothing about weight loss surgery. Any advice appreciated. I want to know can I take superfruit slim being a diabetic diet control and taking mental illness tablets carbamazepine and amlodipine,alfacacidol,cacium chew tablets,is it okay do you recommend it because the doctor didn’t say much,please reply my email address is there because am willing to buy it as soon as possible thankyou. We unfortunately cannot give medical advice and would suggest you speak to your GP if they can see any reason for any interaction between an over the counter dietary supplement and your medication. They are best placed to give guidance so that you are making an informed choice. Has anyone tried these Superfruit pills who have check with a Doctor ? I have cholestral tablets and have just been diagnosed with high blood pressure and type 2 diabetes. All due to carrying to much weight. The advice for all dietary supplements is to consult with your medical doctor when taking any prescription medication or have a pre-existing health condition. We would recommend doing this for any supplement you are considering taking. Hi! I’m so happy I found this website and all of these comments, it’s been so helpful. I eat healthy and i exercise (not as much as I should) but I find I’m always hungry. I have about 40 lbs to lose and I’ve been trying for a year to lose weight and I was about to give up but this renews my hope. I just ordered one bottle and I’m really hoping it works. If it doesn’t, I’m going to try something else approved on watchdog because you guys are the first website I’ve come across that speaks clearly and frankly. Thank you all so much! Sorry I meant Jo . U just got the name wrong. Can I take the pills with food and then drink a lot of water or does it absolutely have to be taken without food? We believe you can take this supplement with just water but you may wish to check with the manufacturer. Can you take super fruit diet pills if you have a high blood pressure which is under control with 2 mg tablet? I can’t speak for this company or any other but I think any reputable company would tell you to check with your Doctor first, especially with something like blood pressure medication. I’m considering trying this product, however I want to know what happens when you stop taking the pills? Do you start to gain weight quickly? I don’t want to become reliant on these pills for a long time! I’d like to get down to my preferred size and then come off them! Can anybody help? I think the best approach for any of these products is to use them to help you modify your own diet and lifestyle choices. That way you don’t see any huge swings in your body weight. As a result, if you modify your choices and get inspired to exercise more then it should give you the springboard to a healthier and more active lifestyle and consequently lasting weight loss. Hi Watchdog team, I am considering trying superfruit slim but would like your opinion whether it is better to try this one or Real Dose? How are they different? Does one deliver better results? Which one has less caffeine? Hi I’m really interested in buying these but want to know if it is a one off payment or if you are subscribing to them and they continue to take money from your card like many other diet pill companies?? One of the crucial parts of the checks we do for any recommended product is that it is a one-off purchase with NO recurring charges. You are quite right to be concerned about this as any company that offers further charges or free trials is likely to be trying to dupe any potential customers and it usually a clear sign it is a scam. We have just double checked again (which we do as often as possible anyway) with the company and they only supply on a straight sale with no further charges. They do offer some discount for future orders if you chose to do so but it entirely of your own free choice. They also offer a guarantee like any reputable company should do to reassure you before ordering. I hope this helps but you can always contact them directly yourself. P.S the shake and protein powder cost AUD $121 for 10/9 days so you can see why I am looking for an alternative. I have lost just about 1.8 kilos but they don’t like to look at weight it’s all about measurements which according to my distributor I have lost about 8cm. But I have also been eating healthy and exercising so this could be contributed to either. First I would like to say thank you to WatchDog as I bumped into this site fishing along for information because I was skeptical of two supplements I was about to order. Yes, WatchDog has been the first site that has given honest information and real customer feedback so GREAT JOB! Kelly, I over-stand how you feel about HerbalLife as I once too was taking it and just recently thought about purchasing again. HerbalLife does work but it also takes time depending on your eating habits and exercise. After reading some facts on the website and customer reviews here I decided to go ahead and try the SuperFruit Slim because of the natural ingredients and budget. Kelly, keep up the good work and you will succeed in your goal. Just got some superfruits to start after new year celebrations and will let you know how I get on. Not great at sticking to diets and do little exercise but see what happens. Hopefully these pills will work for me! Quick update after taking these pills for 3 weeks. I found my appetite less after a few days and definitly had more energy. Tried not to be obsessive with weighing everyday sticking to once a week. First week lost 4lbs, 2nd week 2lbs and this week 3lbs… I am very happy 9lbs in 3 weeks!! I have managed to stick to a healthy diet and tried to be more active, some weeks better than others. From my experience I would recommend these pills. I have no credit or debit card. Do you have a bank account I can pay into? Thanks. This is a question for the merchant, we took a quick look at the shopping cart and it looks like only credit card payments are currently taken. We would get in touch with them though to see if they offer any forms of payment. I already eat healthy and exercise 5 times a week, and I have done this for a long time now, but I just can’t loose those last pounds. I really want to loose my belly fat, so can these pills help me with that? I do not have a problem with eating to much food or anything, I just want to loose more weight. So my question is are these pills designed to help people not eat so much, or will they also burn fat without changing diet? And another question is if I reach my weight loss goal, will I gain the weight back once I stop taking the pills? Just got my pills and i’m confused on the dosage. On the bottle is states 2 capsules “WITH” breakfast no later than 10 am. consume orally with water and no later than 5pm. I saw a previous comment that someone said take it “before” breakfast. So should I take 1 or 2 pills before or with breakfast and/or should I take another pill before dinner but not after 5pm? A few visitors have highlighted this. Feedback from the merchant has confirmed that you can taken both capsules with breakfast in the morning but if you miss the morning dosage you can take later in the day, no later than 5pm. There is a small amount of caffeine in this supplement and so not recommended to take in the evening. Hi. I just received my shipment of Superfruit slim a week ago and have been using it ever since. I have an important question. Once I reach my weight loss goal, will I gain the weight back once I stop taking superfruit? This is what I’m most scared of. Will it slow down my metabolism after the fact? I have been trying to lose weight but not getting anywhere so was looking to see if any pills were available to help. Can you recommend the best weight lose pills that hase no gelatine in( suitable for veg) please. As I’m a vegetarian I obviously can’t take these capsules.. But, if I remove the caps and consume the powder with water or mix in with food, would it work? As far as we understand the Gelatin is only contained in the capsule itself. If you emptied the contents and consumed them it would have the same effect. The capsules themselves are simply to make it convenient to swallow the actual ingredients for the average person, as such consuming them with water or food is not likely to inhibit any of the positive benefits. I’ve tried ordering these pills of the official website but I have no idea what to type in on the payment process, they haven’t made clear what numbers they need. Will these have any affect on contraceptive pills? We’re not aware of any issues with the contraceptive pill and this supplement. You may wish to contact the manufacturer directly though. Have nearly finished 4th pot of these capsules and have not noticed a single pound come off. You Should not call this à bad product just because it did not work on you. On top of that you have not given Much information. Do you diet? Do you excercise? I want thank everyone who has shared their success with this diet supplement. I am super excited to try it. I lost my job a year ago b/c my boss decided she didn’t want anyone who was depressed working for her. Go figure..(I’m still upset about that..uggg.) But I will do what it takes and no matter how long it takes to purchase this diet pill. I’ll take online surveys, clean neighbors homes, even walk dogs (I’m terrified of dogs). I lost my home and car among other things and my daughter and I moved in with my mom (I’m still upset about that too..lol while a softly crying at the same time.) I became more depressed and gained 50 lbs. in one year!!!!! So, I even want to say something to the people who were not as successful with this diet pill. Some people’s road is a bit less complicated than others. But just don’t stop and remain consistent because imagine the joy when we all end up at the same finish line. We will all make it!!!! I’m 19yrs,can i take these pills? This supplement, like most (if not all), can be taken by over 18 year olds. There are certainly recommendations though, for instance if you’re taking prescription medication or have any clinical weight issues you should speak to your doctor/physician first. Hi watch dog can I take super fruit slim while on slim fast? We can see no reason why you can’t take this supplement alongside Slim Fast. We only advise caution when looking to combine diet pills as this can cause side effects – mostly from the stimulant content. That said, Superfruit Slim contains around 100mg of caffeine in total per day (approximately caffeine found in 1 cup of medium strength coffee). I am so glad they so mean good feedback on this product I can’t wait to buy this as I need to lost 3 stone for next years. For our frist family holiday and my best mate wedding. My problem is I am a mum of 3 I gab and go food when I can so I snake a lot and drink a lot of fizzy drink. Thanks Nina for posting here. A number of our visitors have reported having more energy when trying this supplement so this may be just what you’re looking for. Read all of your comments, good to see so many positive comments, i am excited to try this superfruit slim product. In the past. I have tried a lot of different products like african mango, reducta, appetite suppressant tablets without results. I currently weight 14 stones which i hoping to get rid of by using superfruite I have ordered 1 bottle but is 1 bottle enough to lose enough weight. my goal is to lose enough weight to get rid of my belly. The amount of weight loss will vary from person to person and unfortunately never as accurate as some companies say when promoting their products. One of the reasons we like this product is the realistic weight loss claims. There is no magic pill. Taking this supplement alongside healthy diet and some exercise though will almost certainly help! All the best and please let us know how you get on. Hi! Do they ship in Philippines? Trying to buy one but nothing in the drop down menu. Thanks! More power to you guys! Taking a look at the merchant it appears they do not ship to the Philippines at the current time. You may wish to contact them directly to see if they offer any other solutions. I was wondering if it could be possible to combine this with more l-carnitine. There is a brand siken form that presents them in a package that has to be diluted in 1,5L of water and drank during the day. Start today. Not changing a lot, want to see if pills alone makes a difference. Not eating super healthy but also not super unhealthy. How have you gone so far? Hello. Great to read feedback about products. I’m not convinced about weight loss. There doesn’t seem to be enough long term data collected. We all loose water weight first, but does it really help to budge the stubborn fat? This will explain large weightloss to begin with, but when the scales stop moving? Then what? Hmmm, I look forward in reading more. Thank you to those who put up post reg about your progress. Goodluck!!!! You should be find taking this supplement alongside a vitamin supplement. If you have seen our articles you would know we’re not fans of detox supplements. These mostly encourage water loss and tend to not be the healthy way to lose weight. We would suggest trying this on its own, or with the vitamin supplement if you wish. I ordered from uk distributors arrived within 3 days. Im starting today along with the ww plan hoping the pills help me keep on track. With appetite cravings and energy. I don’t think these would work on their own I think along with a healthy eating plan and excerise programme I should get results. Starting weight 185lbs ill post every week x. Can you combine this with something like Optifast? Or would it be better to do either this or Optifast by itself? Ive been taking Superfrut slim for just over 3 weeks now and are now seeing some really good results. Ive lost nearly half a stone which for me is pretty amazing as normally I never lose anything at allv when dieting. I take one tablet when I get up with a glass of water then have my breakfast about 30 minutes later which is usally some fruit and cereals. I take the other tablet latem morning and find Im not really that bothered about my lunch so just eat something healthy insteasd of gorging a load of junk. I find I dont need to snack as much and fell a lot more positive and have more energy during the day. I am aslo sleeping better but not sure if this is from these tablets. I dont think so but its a nice side effect to have, I think I am more active all day so when its come to late evening I am usually ready for bed. I only tried one bottle but have now ordered some more to carry on through the summer to get to my target weight which is just under 10 stones. I have another sone and half to go but fell really confident I can do it. Thanks watchdog guys, I nearly fell for one of the scams but luckily found this site and went for Superfruit instead so best decision i ever made. Well done Aimee, keep up the good work and please do continue to let us know how you get one! Hi Aimee, very curious to find out how you got on with this product? I lost my Daughter in a car accident in August, and found comfort in food and copious amounts of wine which obviously now shows on the scale. I want to go into the New Year by picking up the pieces of my life and getting healthy again, but I want to take the right supplement to counteract the damage from all the acid I’ve been bingeing on. Just got my pills. First 2 to be taken in a mo; will keep you all posted. Yes we agree, it would be good if the capsules were vegetarian friendly. We have heard from customers who have taken the ingredients out of the capsules and taken this way. Never heard of this before but if it works for people then could get around the issue. In what way would his be more effective than eating fresh mango and raspberries and having an occasional smoothie with acai in? Common sense suggests that the whole fruit would be more healthy and cheaper. Eating fresh fruits is very beneficial and would be preferable and a great source of fiber too. The issue is to get the amounts seen in this supplement and others you would simply have to eat too many fruits that simply wouldn’t practical (it would be very expensive too). To use just one example. you would need to ingest 90 pounds of whole raspberries to get around 200mg of Raspberry Ketones! Hi everyone, I have read all the reviews and finally taken the plunge. Order placed, fingers crossed and i’ll keep you all posted. Read all these posts a few times! Order super fruit! Got them today! Looking forward to starting them and stop snacking! I’m good when starting healthy eat but then things happen and I munch on rubbish too much! I’ve just finished college so now I have more time on my hands. I am in the process of moving house so I’m hopeing my cal controller diet and super fruits ill see the lb’s going down. Canicombine this with proactol? They workin different ways I assume a mix can have seriously good results! Normally we wouldn’t advise combining supplements as you could never be too sure how they would interact with each other. This is especially true when considering the stimulants in each product, as you could find you consume too much and suffer potential side effects. With Proactol you should be okay, as it is a pure fat binder and shouldn’t have any undue interactions with Superfruit Slim which works in a completely different way. However if you any concerns or need medical advice speak to your Doctor first. not had huge weight loss down 3 pounds this week. for me its the extra energy without hitting the wall like most energy drinks. Week four of Superfruit and week three of exercise! I weighed in this morning and my weight has remained the same, no weight lost this week. I think there are some things I could change in my diet like no wine with meals. So the next four weeks on Superfruit I will continue exercise and 0 wine! My appetite is still under control which is great and I am losing inches so my clothes are fitting so much better but hopefully over the next four weeks that will translate into weight loss also! Im not giving up! Im going to keep at it until I reach my goal weight! I only had 2 days of tablets. and I weighed in today . Guess what I have lost 1kg already.. 19kgs more to go. but I am really happy it sure does supress your appretite as after breakfast I rarely eat a big meal till dinner time. but the only bad this I found is it gives a bit of heart burn for me. Ok I have been taking these for a week now, I weighed myself today and I have lost 6lbs!! in one week!. I am amazed, I have been on diets before and not used slimming aids and lost half that in one week!. I am going to continue to take these tablets until I reach my goal weight. and maybe even after to help with supressing my appetite. I’m so impressed, I’m sure the tablets on their own wouldn’t have made that much difference, but its the energy burst and the appetite supression that sell them to me. I have been on a low carb diet and try to eat as much fruit and veg as I can, no alcohol and no sweets, besides the odd one every now and then. I’m surprised that I managed to loose that much weight as I went out this weekend and had a lot to drink!!!. but still lost weight!. what more can I say, I love these tablets!!. Thank you for your reply. Please my country, Nigeria, is not listed among the countries the company ship their drug to. I will need to make order but there is no way to. Thank you. am a medical doctor from Nigeria with a great passion for my patients who suffers from morbid obesity and its complications. I am very happy to see all these reviews by the users of this drug. A good number of my patients have tried a lot of weight supplement from both within and without this country. I will like to get them this drug(superfruitslim) for my patient. My country, Nigeria, is not among the country the company ship to, please can this be looked into. Also i will love to be the agent for this company in West africa. Can we just clarify that this product is not a “drug” as it is only legal to sell drugs online via an approved pharmacy. As regards becoming an agent then you are best contacting the company directly as we do not have anything to do with that side of things. Whenever we have contacted them with consumer queries they have always been very helpful so I’m sure they will respond to any queries you might have. I got my pills today. It says 2 tablets daily no later than10 am and no later than 5pm. “With most people we find the best effect is by taking 2 capsules together at the start of their day (breakfast). This is what people report gives their system a boost and sets them up for the rest of the day. However other people prefer to split them up into 1 capsule dosages. This is where we advise to have taken both doses no later than 5pm to get the full effect while still awake. We are looking to clarify the instructions in the future and will be adding clearer instructions to the website. Hope this helps Tanya, we will also add some clearer details to our own review and keep an eye on the manufacturer to ensure it becomes clearer. Hi, I know you said breast feeding women should avoid these, but I’m just wondering why since the caffeine levels are quite low? The lack of safety information is the main reason why diet supplements are not recommended during both pregnancy and breastfeeding. There is a lack of data showing the potential outcome of the commonly found ingredients in diet supplements when breast feeding to your unborn child. So diet pill manufacturers will wish to avoid any risk (and rightly so) and advise not taking them when pregnant or breast feeding. Irrespective of the ingredient profile we would strongly suggest waiting until you have finished breast feeding before looking any dieting supplements. Firstly diet pills shouldn’t be taken for extended periods of time irrespective of how safe and natural they are. They are designed to be used in-conjunction with exercise and a healthy diet as part of a rounded way to lose weight. With this in mind once you get used to eating healthy and suitable portion sizes you should find that you snack less. Likewise regular exercise will mean you don’t just keep that heart and cardiovascular system healthier but burn more calories too. If after taking a diet pill you start to overeat then unfortunately it’s likely you will put on weight. Hope this helps, we wish you the very best. Ok my third weigh in this morning and I am down 1 more pound! I was hoping for at least 2. I am exercising 6days a week(low impact) and light weights 2x a wk so far. The pills continue to suppress my appetite and they have given me the energy to exercise almost every day! I look at weight loss as a marathon and not a sprint and will continue until I reach my goal and then continue my exercise program! 30 more to go! Well guys I have read all your reviews and have finally decided to purchase a pack of this today!!!!!! I will keep u posted on my progress too. I am currently weighing in at 78.9kg and would like to get to my ideal weight of 65kg by the end of this year. I know it sounds unrealistic but I have tried everything to try losing weight diet change exercise. I’m getting married in April next year and really do not feel happy with myself. My confidence is not where I need it to be. I’m hoping with the added ingredient of taking these will help me aid my weight loss. Wish me luck guys. I will be back soon with an update! Hi everyone, just received my order of superfruit slim and took my first lot yesterday morning. I was surprised how alert and full of energy I felt. I suffer with depression and find it hard to get motivated most days. They didn’t make me hyper but they just give me a boost I suppose!. Once I had taken my tablets I was raring to go and demanded we all got dressed and take the dog for a long walk in the park!. my kids weren’t as enthusiastic as me but they soon came round lol. I don’t find that they surpress my appetite that much, I would say that they slow it down maybe. I have brekkie about 8.30-9.00 then by 11ish I would be hungry, but yesterday I wasn’t hungry until 2pm! then I only ate a couple of bananas!. then I had dinner at 6.30 and wasn’t really famished as I normally would be by this time. Anyway, I will try to keep you all posted with my progress as I go and I’ll let you all know how much weight, if any!, I loose. Took my first 2 tablets yesterday and 2 this morning. This mornings I took out of the plastic? container and put one tablet between 2 small pieces of chicken breast and the other in half a banana. I just wondered how the body digests the outer coating? I could taste the mix but it wasn’t too unpleasant just drank some herb tea. The tablet in the banana was best. I need to lose around 4 stone. I have tried lighterlife and it worked and the meetings helped but I do think a big factor is the person holding the meetings. Do you think taking the outer coating is okay? Looking forward to having some more energy. As far as we know the outer coating is made from Gelatin (the stuff used in foodstuffs to set Jellies etc) which dissolves naturally in the stomach. This is to make sure the ingredients are swallowed easily. No plastic or other man made materials are allowed to be used in dietary supplements as they are made under FDA guidelines. You could test this for yourself by placing one of the outer casings in some warm water, after a few seconds the warmth of the water dissolves the casing. This is helped even more by the digestive enzymes in the stomach even further. You are perfectly fine to take the full capsule as it is and do not need to split them. Some people find they are easier to swallow when taken with water and this is advised on the instructions for usage. The extra water will also help in other ways. Is superslim safe for breast feeding moms? after giving birth how early can I take it? I have a lot of weight to lose due to pregnancy. Hope to hear from you. As you come in to the nursing mothers category then it is best to follow this advice and run it past your Doctor. We are not in a position to offer medical advice ourselves so suggest it is best to follow this course of action. Weighed this morning and I am down 1.5 pounds this week. I started exercising this week also and my clothes are already feeling more comfortable. My appetite is still under control and I’m feeling good! My goal is to lose 35 pounds so I have 31 to go : )! Thank you Adrian, I sure will! Going to start taking my SFS this morning, just not clear on the directions. 2 capsules before 10am and on an empty stomach? No pills in the evening? That was my understanding. I take 2 pills in a.m. right before I eat breakfast. Good luck! I’ve been taking super fruit slim for exactly one week and I am down 2 pounds. My appetite is under control as I am still not snacking between meals and I find it easier to stay away from sugars. Also I’m very sensitive to caffeine but have experienced no side effects, thank goodness. Next weigh in, Tuesday June 4th. Started pills on Tuesday and so far I have noticed the suppressed appetite, which was a big part of my problem. Also, I haven’t craved anything sweet. I have yet to feel the extra energy yet though. I’m gonna weigh once a week so by next Tuesday hopefully I will be a pound or two lighter! Good luck everyone! I just received my order today and will start tomorrow. I would like to lose 35lbs! I will also keep u posted! Hi, have just ordered my supply and am really hoping that they work. I have 4 stone to lose and from reading the reviews i feel quite optomistic. I have tried so many other diet pills and nothing has worked. Once i receive my supply i will update on my progress. Wishing you all luck with your weight loss. Watchdog i never seem to get a reply until i have messaged the second time, there is a sachet in the bottle a little white one which says it keeps the product fresh should that remain in the bottle? Or remove it? You will find this little sachet in most, if not all, supplements when sealed. Once opened you can discard it. As you say it’s used to keep the contents fresh during transit. Hi Watchdog, I am presently on a diet , where you remove gluten,dairy,eggs,sugar,corn(maize), peanuts and soy for a specified time. Can you tell me if any of these are present in Superfruit Slim tablets? Apart from the ingredients listed above each capsule contains: Gelatin, Calcium Carbonate and Magnesium Stearate. The gelatin is from a bovine source and so wouldn’t be suitable for vegetarians. Looking at your list you should be okay. Is it safe to take with phentaslim? We would recommend either taking one or the other and not both at the same time. Both have received good feedback and would recommend either, but if you’re sensitive to caffeine or prefer to consume less caffeine per day, then this supplement is a good choice. Watchdog staff have you got any idea if these will effect the contraceptive pill? I dont want to try and lose weight and end up pregnant?! We’re not aware of any issues with the contraceptive pill. We have contacted the manufacturer for more information. If you’re very concerned you may wish to confirm with your GP and/or contact the manufacturer directly too. Hi watchdog i normally drink hot water wiith lemon on an empty stomach in the morning can i still do that whilst taking the tablets ? Apologises if our reply was a little slow, we do get hundreds of emails/comments each day and try to get back to everyone within 24-48 hours. So in answer to your question, the recommended dosages is suggested to be taken with breakfast each morning. We contacted the company who have said that you can take them at lunchtime too and the only reason they suggest the morning (and not to take them later than 5pm) is because of the caffeine content, which is the equivalent of two thirds of a cup of regular coffee. From our experience it can also help taking them in the morning as it means you’re unlikely to forgot later in the day. So in your case you could easily take them with lunch. hi, Can anyone tell me if supafruit slim works during the menapause. There are no known negative side effects with taking Superfruit Slim on it’s own. As for taking with a colon cleanse pill well we aren’t fans of these types of products and have rejected a few such supplements. Many colon cleansers work as diuretics and can make you dehydrated. Instead we would suggest taking one of the approved supplements. Ive tried the acai, raspberry keotone and nuvoryn diet pills and NONE of them worked. Is there a chance that these superfruit slim wont work either? I am desparate to lose weight and I have tried weight watchers and lighter life but in the end could not afford to keep them up. I have 6 stone to lose to be at a healthy weight I am so depressed about my weight. Hello! I checked the site. They only accept credit cards? I wish paypal is also possible. Will also try to contact them. Thanks a lot! im interested in taking these but im not sure that it will work, i taken raspberry ketones before and found no change at all i do feel liketrying these do you think itll be worth the try? i really need to find a good diet pill to lose weight!! The great thing about Superfruit Slim is that it is not just a Raspberry Ketone product. Research has shown that the optimum amount of Ketones in a product is 200mg which is what Superfruit Slim contains. Not only that it also has African Mango, Acai Berry and Green Tea in the correct amounts to work together for better results. This is what makes is different and is why many people are reporting back to us with excellent weight loss results. The biggest factor is deciding whether it will work for you is making sure you modify your diet and get started with some exercise if you are not already doing so. If you do this and take a high quality supplement like Superfruit Slim then I’m sure you’ll get the results you are looking for. Thanks for the great review. however, i was wondering if the company produce the same tablets but that are suitable for vegetarians? The existing product is made from capsules that contain Gelatin, therefore they are not suitable for vegetarians. As you may well know it is very difficult to find supplements that fully comply with certain dietary requirements but this is something we are looking to investigate in the future. It would be great to find a range of products that are suitable for vegetarians, vegans and others with specific needs. Just a quick update. I have read some people are confused on how to take these tablets. Take 2 daily before breakfast! Drink with half a pint of water. Throughout the day drink the recommended 6-8 glasses of water. I am still losing weight with these tablets and I am very happy to put my name to them. I have found no customer reviews for this product anywhere but this site, and to be honest it has been your reviews that you keep updating that have helped me make my mind up. My Superfruit Slim pills arrived today and i start taking them tomorrow morning, im excited. I have already for the past 10 days cut down on my eating and cut out all sweet things and sugar etc, try to stick to two small carbs a day and lots of fruit and veg. I think its helping already but im hoping that taking these pills will just boost what i am already doing and the fact that they are natural is always good. So my goal is to lose 2 stone but if i lost just one i would be happy, more is just a bonus. Well anyway i just wanted to thank you for you updates and for helping me make my decision. I wish you all the luck with your continued weight loss and i am keeping my fingers and toes crossed for mine! I want to purchase superfruits but I want to know first how I should be taking them since I work the night shift, from 9PM to 6AM. How should I take the pills to get maximum results? We will contact the merchants with your question and get back to you as soon as they reply. I have seen https://www.superfruitslim.co.uk is this the same company? I am interested in buying but want to make sure its legit. Thanks for your enquiry regarding the superfruitslim.co.uk website. We can verify that this site belongs to our company and is a genuine outlet for superfruit slim. We are developing the site to focus more towards our UK customers with lots more testimonials and positive feedback from our existing consumers. Superfruit slim has been a huge success in the UK and we are working hard to bring the product to even more people. Recently we ran extremely low on stock due to the huge demand but this has recently been rectified after the manufacturers worked around the clock. I was wondering if i could get some advice as I’ve been looking into buying diet tablets. I joined the gym in January and have been going regularly, I enjoy the gym and have noticed a positive difference in my fitness however I wasn’t eating healthily and wasn’t loosing weight, so i decided to buy RE:Active T5/Super Acai. After having almost gone through the 60 tablets I have found I haven’t lost any weight, however I didn’t take them as often as I should have, with only having 1 in the morning and occasionally another in the afternoon. I have gradually started to change my eating habbits and find that i eat a lot more fruit and veg and have cut out fizzy drinks. My meals are generally healthier but I still can’t cut out the snacking or the occasional take-out. I’m terrible at dieting and have no willpower, I especially find that I get very hungry at night time and crave quite filling foods like sandwiches. I also like to go out once a week with my friends and I have a lot of alcohol, something I don’t think will end up changing. Basically I’m wanting to find a diet tablet that will give me energy and hopefully stop my cravings, I was originally looking at the activ8 drops however it says you have to have a strict calorie intake therefore thought if i couldn’t stick to it, that it wouldn’t work. So my point is, if I can’t cut out the alcohol or bad food, even tho i still go to the gym, will the diet tablets still help me to loose weight? Have heard that before starting diet or diet pills you should cleanse your system. Is that true? Will diet pills be more effective? There is a lot of advice and speculation about cleansing or detoxing your body before embarking upon a weight loss programme. There are also many so called cleansing supplements and products available that take advantage of this commonly held belief. Instead we would suggest looking at making changes to you diet, eating a healthy diet as part of your weight loss programme will be more beneficial to you long term and will help you feel great too. Using diet supplements (not cleansing detox products) can certainly aid weight loss and why many of the superfruit type products are popular. I took the pills for seven days with no results. so I decided to return the product before my 30 day free trial expired-as claimed. I sent an email requesting a RMA#, which is required from the customer and they question what I did or did not do ?did I take the pill as suggested. I sent the product back. To my disapoinment, I received an email confirming my return and I will receive a refund of $39.95-mine you-I paid 49.95-I questioned the $10 charge. I was told the company charge a SMALL filling fee that was written in the 30 day free trial.so read closely &be sure. Thanks for the feedback and although it didn’t work for you it’s good that you received the refund. We took at look at their terms and conditions and they do say there is a small handling fee of $10 that is applicable for any order of 1 or even 3 bottles. We should clarify that its not a “free-trial” though they company are offering a refund on opened bottle, which few supplement companies offer. Out of interest did you change anything whilst taking the supplement for 7 days, such as your diet or any exercise? Although you would expect to notice some effects during 7 days must realistic manufacturers would probably suggest taking it for longer to see results. Hi, can any experts advise if these pills are safe to use whilst also taking prescribed Fluoxetine tablets? We believe like all diet supplements that you will need to consult a doctor before taking them if you’re on any prescription medication. The manufacturer also states you should speak to your local GP if you have a pre-existing medical condition prior to taking them. I started taking superfruit slim on 24th Feb and have not lost any weight. I am taking one at breakfast and one with dinner. I see that Jo recommends taking 2 at breakfast. I will try this from tomorrow and will report if any weight loss over next week. advise me iam on blood pressure pills are these ok to take with them . Hi, I’m 5 days into using them, I struggle with dieting alone and just needed something for extra boost, so far have noticed I have more energy and I’m picking less, so managaing to stay on my 1300 calories and exercise, this week I lost 2lbs before this week I was only losing 1lb a week. I have ibs so can only take natural products and so far have had no side effects with these pills, so far so good all positivein my view! Hi Jo, since i’m reading your reviews submitted in 2013, i’m wondering how are you today (2015). For how long did you take these pills? How was it when you stop taking them? Thank you in advance for your reply. I ordered these just after Christmas and was excited to start them in the New Year. I got a two month supply and was determines to see how it colud help me. I looked closely at my diet and have cut out all the “beige” food like Cakes, biscuits and other processed food like that. So far I have lost (in 7 weeks) nearly a stone in weight and my overall firness and health is so much better. I generally feel a lot better and have the energy to do things I never did before. I have started a Zumba class and even met some new friends so all in all I have nothing but good things to say. Im not sure superfruit slim would have made the same difference if I took it and didnt address my diet and exercise but as an extra tool it has definately helped. I read somewhere that there are no magic pills and you have to make other changes but if you do this then it has made a change to my whole life. I just reordered some more as Ive nearly run out and tell all my firends and family about them. At the end of the day the small cost has made a big difference to my life so Im more than happy. I have a similar story to you suzie but have only been on them for about a month now. So far so good with a steady change to my body. I don’t weight myself much as I used to be obsessed about it and was weighing myself 3 or 4 times a day so got upset when i even put half a pound on! I have a better outlook now and go by how i feel and how my clothes feel on me as being a woman you know yourself how your weight can shoot up and down with the monthlies. I have dropped a dress size and comfotably fit in clothes i havent worn for yonks so am well happy overall. Best thing it has done is force me to have a better outlook to my weight and concentrate on living better as well. I might even have the confidence to join a zumba class as well lol very soon it sounds like a lot of fun but for now will stick to my walking to work and back every day something i never did before. Maybe we should start a self help club or something and share some support! Great idea regardinga club!!! I think thsts the biggest issue for me.The pills arived today…..lets,see how it goes!!! Hi jo I’m glad their working for you… I have been taken for almost 4 weeks I did not lost 1 kilo I’m so frustrated Koz I have tried almost everything. Any advise ? Been taking the recommended dose for over a week and other than the first day when I appeared to have a surge of energy nothing else noticeable has happend. I have been on a healthy eating programme for over 3 weeks plus the gym 3 times per week ans was hoping that these pills would enhance that. Sadly disappointed and feel that you would do just as we’ll sticking with multivitamins. Thumbs down from me. How much have you lost and how long have you been on the pills? Wondering if anyone in Australia has ordered them? And if so how long delivery took? I place my order on Wednesday.and had a reply by Thursday that my order has been dispatched. Can’t wait to try them. Hi I ordered These on 5th February (Ireland) and have not received them as yet! How long does it take? The manufacturer states that International orders can take up to 15 days so it’s very likely still on the way. If you haven’t already, we would suggested contacted the company directly. We will also send an email asking for information on delivery dates. A follow up to your comment. The manufacturer replied confirming that International orders can take up to 15 working days depending on the location of the consumer. We understand they are moving more of their distribution to the UK/EU and so orders will be faster. Hi Got them today, not through the USA but through their new distributor based in the UK. Spoke to the a very nice guy by the name of Andy, he told me he would despatch them from UK on Friday of last week and I would have them by Wednesday – well hey Presto I got them this morning, excellent service, very impressed, keep this up and I will use you again. I’ll let you know how I get on in about two weeks time !! I am in Milan, Italy and custom regulations are quite strict here specially about food products and medicines. Will I not have any problems if I order a 4 month supply? I have been reading reviews and was wondering why it does not work for some? I’m afraid to waste money if I will not lose weight. Please tell me I can get them here 🙂 and how much. We believe you can order to South Africa without any problems from their official website. The cost would be in USD and so the exchange rate into Rand will depend on the rate on the day and your bank. An update to South Africans, we believe that it’s not possible to buy Superfruit Slim in South Africa. The information from the merchant is due to issues on the ground with local South African postal services, both in terms of reliability and with charging additional fees. We checked the numbers on their website and although we didn’t get to speak to customer services because they were busy the number is actually working fine. We followed up with an email enquiry and they got back to us within a few hours. can you send me a link to the site to buy this. The links available in this review will take you to the official website that sells Superfruit Slim. I’ve been taking the pills from 26th of January after I was flabbergasted that I gained 5kg after winter break. I ate the pills in wrong way for first week and contacted the support team and replied instantly. I weighed myself on 8th February, so 2nd week and I lost 2 kg, no exercise as my legs can’t be strained too much, no changes in meal as I am in boarding school which expects me to eat every meal they provide. I don’t know though, I don’t feel full. I feel pretty normal, I still craved for sugary stuff. I don’t know. No side effect except I’ve got really thirsty lately and frequently go to toilet. I need to shed 13 kg to be considered normal though. -_- I wonder if this helps. Following the reviews on this web site thought I’d give the Superfruit Slim a go. Can’t say that I’m too surprised to find that they have had no effect whatsoever. Yes I have given them a fair crack of the whip – been taking them for just over 4 weeks, and I can’t say that I’ve noticed the appetite suppressant bit either. My wife has also been taking them the same amount of time as me, and she is of the same opinion as me – a complete waste of money! I guess the old adage that if you want to lose weight “you’re going to have to expend a lot more calories than you consume” is going to be the only way to lose the lbs. I have been taking them for just over a week and have gone from 17.8 to 16.6. am on calorie control but with out them i was losing about 3 pounds a week. with its almost a stone! sounds good to me! the appetite suppressant works really well and also i feel more energised. no complaints here and i will definitely order more when i run out! Well done Chris, sounds like you’re doing well. Keep up the good work and please do keep us informed. I am currently not on any slimming aid as im trying to do some research what xls product was you taking and why are you changing after good results ? and which one is better ? can you take combinations of diet pills? what about all of you three recommended at the same time – desperate times!!!! We would not recommend taking all three. Although Superfruit Slim and Acai Plus don’t contain lots of caffeine we would urge caution when looking to combine products in case the combination of caffeine products is simply too much. For certain care is advised when taking Thermobol for it’s high caffeine content. Instead we would suggest choosing one of the products and trying this first. I’ve been on these for a month now. For the first 2 weeks I didn’t diet, I just took the tablets as described. I didn’t lose any weight, in fact I put on 2lb. So then I followed a calorie controlled diet at 1250 kcals, I lost 5lb the first week and 2lb the second week which is pretty much what I’d expect from the calorie controlled diet. So, not entirely sure how well these work but I don’t feel too hungry before meals so the appetite suppression ingredient works. I’ll keep taking them as they’re full of good ingredients and I have another 3 months worth. I have 4.5 stone to lose so there’s a fair way to go! Good luck everyone. Great feedback Jane. You’re certainly correct, a low calorie diet will definitely be the reason for losing weight. It’s good to have feedback that the appetite suppression lives up to the claims made by this product. Please keep us informed on your progress. Hi Laura. In my experience I am losing three pounds a week. I am not following a low calorie diet but eat less due to my appetite being suppressed. Due to my arthritis I can’t exercise so my weight loss is purely down to Superfruits Slim. Good luck with your weight loss journey. Congrats on your success. I too have knee arthritis and walking for exercise is not an option at the moment. Also have meds for high bp, so this Superfruit pill will Work with minimal exercise and does it effect the bp? Hi, I think putting weight loss aside, the ingredients in Superfruit sound very healthy and there doesn’t appear to be much in the way of side effects – however, I don’t think ‘slimming’ pills are the answer to losing weight. OK, so you lose the desired pounds or stones, great, but what happens when you return to normal eating and your appetite is no longer supressed by these pills?? Long term weight loss involves will power, any food you like but smaller portions as well as fruit and veg. Not trying to put people off, but this was advice given to me by my doctor a year ago. I lost two stone and reached my ‘ideal’ weight and have not regained it! It also didnt cost me any extra money either! Anyway, good luck to all you slimmers out there, however you decide to go about it. Hi Ellie, congratulations! There is a book I could recommend, if you’re interested. “The Blood sugar solution,10 day detox diet. Dr Mark Hymen’ and the PGX fibre he recommends. Can anyone tell me where I can order these? I have received a bottle of Superfruit Slim today. Taken 2 caps during breakfast and halfway having BF was feeling full. It’s too early to report it’s working; as the day go by am feeling wanting to drink water always. Will update on progress positive or negative. It’s my day 7 on Superfruit Slim. Lost 1 pound, disappointed yes as am expecting 2 pounds. Appetite suppressant works. Side effects: my lips have tingling sensation especially half hour from taking them. Have been drinking lots of hot water. My coffee and tea beverages is almost non existent. My target is to loose 1 stone. Lots of energy during the day. No problem in sleeping. Despite eating and drinking too much on Saturday When I did not take the superfruits I still managed to lose 3lb this week. I’m very impressed and still not hungry. 11lb in four weeks! Great news Jo. I am going to order Superfruit Slim before not too long; I’ve been taking Capsiplex Plus, and am very disappointed (and will leave a comment on the relative page of this site). But it’s my own fault. If I’d known of the existence of the dietpill watchdog beforehand, I would never have ordered Capsiplex. I know Superfruit Slim is working for you, but I’d still be interested in updates if you can be bothered providing them. Thanks and best wishes. Sorry meant does NOT have these side effects. Whenever I take any diet pills I always have two side effects 1 I can’t sleep at night 2 My forehead always feel fuzzy. Just want to know can you suggest any diet pill which does have these kind of side effects. The common cause of most side effects in diet pills is due to the amount of caffeine in them. This supplement is low in caffeine and uses other natural ingredients to give the desired weight loss effects. Hi Mark. Another 2lb this week and considering what I ate and the wine I had last week I would say that’s very impressive. 8lb in 3 weeks is very good for me. It’s so easy no need for calorie counting and never feeling hungry. I dont pile my plate up like I used to. I have changed he way I think about food. I have yoyo dieted for years and always ended up bigger than when I started. Now I can put a sensible portion on my plate and feel satisfied at he end of the meal. I’m sure you will be impressed. As long as your in he right frame of mind to make changes to your lifestyle I’m sure they will work for you. Let me know how you get on. Thanks Jo, for taking time to reply. You sound very happy with Superfruit Slim, and so far I have read nothing negative about these pills. I think I’ll try them!! Please keep us informed as to your weight loss. Thanks for posting Mel, we look forward to hearing your feedback. We wish you the best of luck and stay in touch. I’m on day two of superfruit slim. I have weighed myself and plan to keep my usual diet and excercise regime. I have two stone to lose, in order to get to my ideal, healthy weight. The reason I don’t intend to change my current diet and excercise plan is because I did this three weeks ago, I am on a sensible eating plan of 1200 cals per day and am power walking for an hour, 5 x a week. I’m steadily losing 2lb a week. I want to trial these slimming pills accurately to see if they have any effect without any calorie decrease or burning off cals with extra excercise. Obviously the less cals and more excercise,the more weight you lose, regardless of taking any pills! Hence I’m not changing anything to see what the true results are. I intend to weigh myself accurately at the same time of day, same clothes, same location in one months time. See you then for the results and here’s hoping this is not just another clever marketing ploy. Lets face it we are big business !! Mel , just wondered if they worked without changing your normal regime. after being scammed by Slimtone plus (i did get refunded eventually) i have now ordered superfruits slim, fingers crossed and will update once received and tried. I got scammed by Slimtone as well Alison. As a precaution I cancelled my credit card and got a totally new one. Just so they can’t continue to take any recurring payments even after cancelling. I jus read about keytones I got the trail few wks ago paid with my credit card really really worried now need too ring credit card company tomorrow c if I ad money taken as well.. If so how wud I able to contact them get my refund??? Its worth bearing in mind that not every supplement that has raspberry ketones in automatically charge your credit card if that is what you are worried about. This company only charge you for whats purchased and should be clear on this companies website or any other website that sells similar products. Let us know if you have a problem though. Hi, I’ve been taking raspberry Kenton plus for 30 days now I’m also on a low calorie diet . I have not lost 1single pound in the whole month . Should I try the superfruit .? It’s unfortunate that you haven’t gotten results with the Raspberry Ketone Plus product. Superfruit Slim does contain higher and more potent amounts of the superfruits compared to any other similar product. Feedback has been good from a few consumers suggesting it does indeed work. That exact same thing happened to me, although it stopped my cravings i found i didnt loose anything but am willing to try these maybe? Could I take superfruit with the lighterlite programme. You should be able to take this supplement alongside any healthy eating programme. We have contacted the merchant but if in doubt we would suggest getting in touch with the merchant directly. Hi, I saw your note about lighter life. I did that program about 5 years ago and lost 30lbs in 10 weeks. But boy! Did I suffer in the end. My hair fell out and my metabolism was all over the place when I went back to normal eating. It took me 2 years to regulate myself and get my hair back to normal. Don’t do it! I also did Lighter Life 6 years ago and lost 4 stone in 5 months. It was 2 years before i was back to the same weight I’d started at because the counselling sessions didn’t really give advice on maintaining my diet as I was diagnosed with Binge Eating Disorder. I would NOT recommend it to anyone. I have now been taking superfruits slim for 13 days and weighed myself for the first time. I was amazed to see I have lost 6lb! I am really pleased with this. The tablets have clearly suppressed my appetite as I no longer pick between meals. I just do not feel hungry. They definitely help me to eat more sensibly. I can highly recommend them. That’s great news Jo. We like to hear success stories like this… well done. Keep up the good work. That’s fantastic Jo; I was waiting to hear how you were getting on. Are you exercising a lot (or more ) as well? I’m seriously thinking of trying Superfruit Slim (if I can find it here in Italy), Keep us informed of your progress!! We would strongly advise against anyone under 18 years of age taking ANY dietary supplement unless taken under medical supervision. All the diet pills we have reviewed to date have these manufacturer guidelines. Can I take the superslim along with it? We would be concerned with the amount of caffeine consumed if you took both products. Although we haven’t reviewed Grenade yet, we are aware of the product and know it has a fairly strong caffeine content. Whilst there isn’t much caffeine in Superfruit Slim (equivalent to around a strong cup of coffee), we would exercise caution if attempting to take multiple diet pills at the same time. Thanks for your question, unfortunately this is one for your health professional or local GP to answer. We simply cannot give medical advice, speaking to your medical physician is best as they know your full medical history. Hi, Jo. Are the pills working for you since you last reported on January 3rd? If so, how much weight have you lost? After trying quite a few different slimming aids in the past I am pleasantly surprised by these ones so far. As per previous comment, it is still early days but the scales definitely seem to be going in the right direction. And now the new year parties are out of the way I’m hoping I can put a bit more effort into the exercise and healthy eating to see even better results. We have been informed by the merchant that the capsules are made from gelatin (bovine source) and so won’t be suitable for vegetarians. Did you mean Phenocal? If so, we have reviewed this product and unfortunately had to reject it for a number of reasons. By all means check out our review and get back to us if you need further assistance. I have been taking these for a few days and can report no side effects. Only lost a pound so far but am hopeful as its early days. How much weight should I expect to lose? Wondering why they don’t ship to Kuwait!!! Good question Munira. We will get in touch with the merchant and ask. May be worth getting in contact with them as well to ask why and if you can have Superfruit Slim shipped to Kuwait. Just ordered and really hope this works for me. Not said here so use the 10% code on the site until new year. Thanks for bringing the discount code to everyones attention. It seems that they are offering a code at the checkout which we had not previously seen. If you put in NEWYEAR10 then you get the 10% discount. No idea how long it will last, but we guess it will be into 2013. Just ordered a bottle to try, there is nowhere to put the discount code so I think it can be assumed that the discount has ended. We believe the discount code was only up to the 1st January 2013. As far as we know there is no other discount currently available.